Namaskar and Welcome to this episode of the Master Builders of India. India has a rich and vibrant legacy of architectural heritage. Starting from simple and humble natural habitats such as rock-cut caves, man attained advancement and perfection in building skills, which found its manifestation in varied architectural forms. The places of worship were the most revered amongst his creation. India is the birthplace of many religions. Hinduism, Jainism, Buddhism and Sikhism originated in India, while Christianity, Islam, Zoroastrianism and Judaism found here a congenial abode. In fact, nearly all the world’s great religions are represented here. 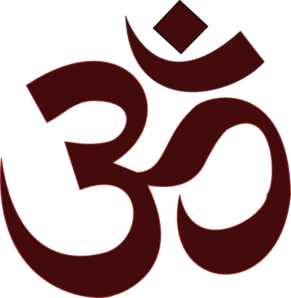 The Hindus worship Gods and Goddesses in various forms. According to the religious texts of the Hindus, there are 330 million gods and goddesses. The art of construction of Hindu temples across the length and breadth of this vast country developed into three major architectural styles, namely the Nagar style: practiced in northern India, from the Himalayas to the Vindhyas; the Dravid style: employed in southern India, from the Krishna river to Kanyakumari and the Vesara style, which was confined to Western India and the Deccan. Besides, some regional styles also developed, which were dictated by the availability of the construction material, climatic conditions, and other such elements. One such style developed in Kashmir –home of the mighty Himalayas which is considered by the Hindus the abode of Gods. Situated in the beautiful Lidar valley, the Sun temple at Martand is the largest Hindu temple in Kashmir. It was constructed during mid-eighth century by King Lalitaditya Muktapida, the greatest ruler of the Karkota dynasty, who ruled between 724 and 760 and controlled a greater part of Central Asia and Kashmir. The great temple of Sun at Martand is the model of all subsequent Hindu temples of Kashmir. Its design is that of a comprehensive central structure comprising the sanctuary standing within a rectangular courtyard, surrounded by a cellular peristyle which is entered by an imposing gateway. The central shrine is placed in the middle of a rectangular court, measuring 220 ft. by 142 ft. In front of the main shrine there is a portico, which was meant for performing special rites. Between this portico and the garbha griha or the sanctum sanctorum, is another small chamber. The main shrine was originally covered by a rectilinear pyramidal roof, and attained a height of close to 75 ft. Nothing of this roof has remained now. The massive decoration of its exterior contains elements typical of the architecture of Kashmir. On each of the four façades is a pediment supported on fluted pseudo-Doric pilasters enclosing a trefoil arch. This arch once enshrined the statue of the Sun god Surya or Martand, from which the locality derives its name. The magical impact of this temple is created by its impressive scale and rich pattern of various decorative elements of the façade, which give light and shade effect. The temple architecture of Kashmir developed a style of its own differing from any other in India. Another style of temple architecture that was employed extensively across the Vindhyas and was raised to the pinnacle of its glory under the Chola dynasty, was Dravidian architecture. Though this style had all the basic features of the temple architecture, such as the walled enclosure, impressive gateways and the elevation of the shikhara, it differed substantially in the execution of these building elements. The most representative temple of the Dravidian style is the Brihadeshwara temple at Tanjore. This majestic temple at Tanjore or more correctly Thanjavur, in Tamil Nadu, is the masterpiece of the Dravidian temple architecture. It was built by the Chola ruler Rajaraja the Great, in the beginning of the eleventh century. It is dedicated to Lord Shiva, and is known as Brihadeshwara Temple and also as Rajarajeswara Temple, a pun referring to the presiding deity, Shiva (Rajaraja Iswara or the Lord of Rajaraja) and also to its royal builder. The temple stands within a walled quadrangle measuring 500 ft by 250 ft. This courtyard is composed of many structures. Nandi pavilion stands midway between the main entrance into the courtyard and Vimana or the main temple. The main structure of the temple stands near the inner end of the courtyard. Its base is square, each side measuring 82 ft., and is dvitala or two storeys high. Above this is a lofty shikhara or tower consisting of thirteen successive storeys of successively receding tiers. The crowning dome rests on a massive granite block, which is 25 ft high and weighs about 80 tons. The total height of the Vimana thus reaches a towering 190 ft. But there is an artistic balance between the stupendous architectural mass and the aspiring verticality. The whole edifice is covered with sculptures and decorative motifs. But here too, the form dominates the composition and all ornamentation is subordinate and complementary to it. A flight of stairs lead to the mandapam comprising of the pillared portico and a large assemble hall that opens into the garbha-griha or the sanctum sanctorum, where the great Shivaling has been installed. The Bhihadeshwara temple at Tanjore is the largest, highest and the most ambitious production of the temple architecture. Percy Brown, a renowned authority on Indian architecture, regards Tanjore as the touchstone of Indian architecture as a whole. Jainism was the first reformist offshoot of Hinduism. Its last apostle, or tirthnakar, Vardhaman Mahavira was a contemporary of Buddha. The finest examples of the Jain temples are seen in Rajasthan – at the Dilwara temples at Mount Abu, in Sirohi district and at Ranakpur in the Pali district. The construction of this temple began in 1389 and took fifty years to complete. The main shrine is dedicated to the first Jain tirthankar Adinath or Rishabhdeva. It features a complex floor plan with multi-storeyed porches and balconies. The temple has entrances at the four compass points and as such belongs to the Chaumukh style. In the central chamber is the quadruple image of Adinath in white marble, facing in each of the four directions. In the upper storey is a similar shrine approached by doors opening from terraced roofs of the building. The whole temple complex is raised on a lofty basement, that covers an area of 3720 square metres. The foundation is 35 feet deep and the temple is at a height of 102 feet from the ground. Near the four angles of the court are four smaller shrines, and around them, or on each side of them, are twenty domes, supported by 420 columns. The central dome or Mandap in each group is three storey high and towers over other domes. A remarkable architectural feature of this temple is the forest of 1,444 pillars that abound its interior. The whole temple is on pillars, but the workmanship of each pillar is so different that no two pillars are alike. The summit is of plaster and not of marble. It is, therefore, not weighty. The temple is so artistically built that one can see the image of the presiding deity from any corner. Ranakpur is an outstanding feat, not only for its architectural simplicity but also for its decorative grandeur. Another religion that was contemporary to Jainism, and has given to the world the some of the earliest surviving pieces of art and architecture, was Budhhism, founded by Gautam Buddha, over 500 years before Christ. In course of time it transcended the boundaries of India and reached Ceylon, Burma, Thailand, Cambodia, Central Asia, China, Nepal, Tibet, Indonesia and ultimately Korea, Japan and Mongolia. Two major classes of Buddhist shrines developed soon after the death of Buddha sometimes in 483 B.C. One of these was the Stupas and the second Chaityas. The Stupas were primarily relic shrines of Buddha, and later also those of other Buddhist saints. The finest examples of the Stupa architecture are located at Sanchi, near Bhopal. The largest of the three main stupas at Sanchi consist of a hemispherical dome or anda flattened at the top and crowned by three superimposed umbrellas or chattravalis. The shafts or yastis of these umbrellas are planted on a box like structure called harmika, within a square railing or vedika. The dome is situated on a raised circulars base or medhi, meant for circumbulation or pradakshina. It is approached by a balustrade double stairway or sopana on the south. Built during the reign of Emperor Ashok, the original brick structure of this stupa was enlarged to nearly twice its previous size and was faced with stone, perhaps a century later. Massive railings and four imposing gateways or Toranas at the cardinal sides were also added. Both these railings as well as the gateways were embellished with exquisite sculptures depicting human form, flora and fauna. Of special importance are the relief panels and the friezes depicting scenes from the life of Buddha and from his previous incarnations. The Great Stupa at Sanchi served as the structural model for the later ones, and came to be recognised as a virtual icon of the Buddha. The second category of Buddhist monuments are the Chaityas or Assembly halls. In their form and use these were the virtual temples of the Buddhism. With very few exceptions all of these are cut in the rock. The plan of the chaitya consists of a nave separated by rows of columns from smaller aisles terminating in a semi circular apse, in which was located the principal symbol of worship, a rock cut stupa. The whole enterprise was thus more of a sculptural rather than an architectural exercise. After the perpendicular rock wall had been cleared and smoothed off, the outline of the intended façade and entrance was delineated upon it. The workmen began by tunnelling into the cliff at the level of the intended height of the vault of the interior. In this way the need to erect any scaffolding was obviated. After the ceiling and roof were completed, the workmen continued quarrying downwards, removing the debris of rock through the open façade and disengaging the columns and the carved stupa at the rear of the edifice. These creations constitute the earliest surviving embodiments not only of the Buddhist architecture, but also of the Indian built heritage. The latest religion that was born in India, originated during the early 16th century as a social and religious movement spearheaded in the Punjab. In course of time it grew into a distinct religion called Sikhism. Today Sikhs are spread all over the world. In India they constitute 1.9 percent of it’s over one billion population. Though of a recent origin, the building art of the Sikh shrines soon evolved its distinguishing features. Its dome is different from the domes of mosques or Hindu temples, so are its arches, balconies, columns, interiors and the general layout. All the shrines have a flag mast called Nishan Sahib, which is draped in yellow or blue cloth, and has a triangular flag with the Sikh insignia Khanda or the twin double-edged sword. After Guru Gobind Singh, the Guru-ship was manifested in the sacred Sikh scripture – the Granth Sahib, which is since then revered and venerated by the Sikhs as the Guru Granth Sahib. The Sikh shrines are called Gurudwaras; literally it means ‘door leading to the Guru’. Thus the term itself contains an architectural connotation. Inside, there are no idols; instead the Guru Granth Sahib is placed on an altar. 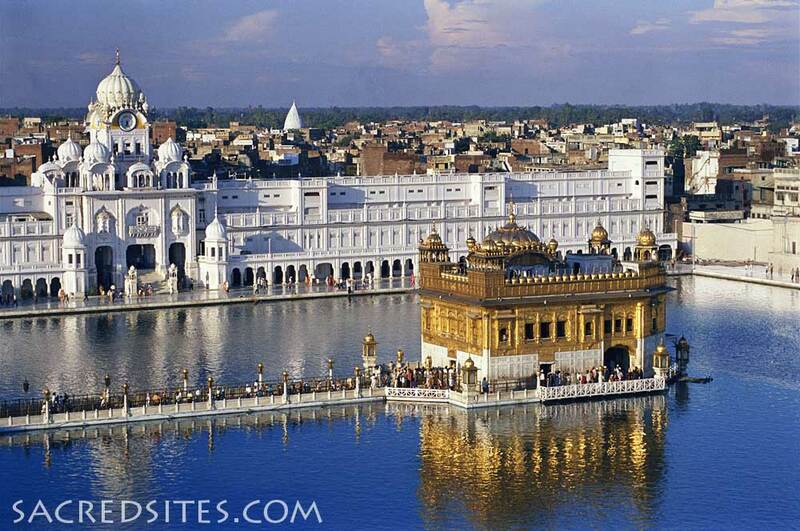 The most celebrated of all Gurudwaras is the Golden Temple at Amritsar. Known also as the Darbar Sahib and the Har Mandir Sahib, it is the chief pilgrim centre of the Sikhs. The original structure of the Darbar Sahib was constructed sometimes between 1588 and 1604. However, for the next century and a half it withstood many destructive attacks by the Mughals and the Afghan invader – Ahmad Shah Abdali. Subsequently, it was zealously reconstructed between 1764 and 1776. The Golden temple, as it appears today, took shape during the reign of Maharaja Ranjit Singh. The main shrine is situated on an artificial island in the midst of a tank called Amrit Sarovar, or the Pool of Nectar, thereby giving its name to the city of its locale. The shrine is approached through a causeway from the western side of the tank. Darshini deohri –the main entrance to the temple complex – is situated at the head of the causeway. The main edifice is erected on a square marble platform measuring 64 feet on each side. The shrine itself is hexa-square in shape. Its western, northern and eastern sides are straight, and each measure 40½ feet; the eastern side is in the shape of a half-hexagon, giving it a unique shape. The elevation of the shrine is also unique. It is a two- storeyed structure, surmounted by a terrace pavilion, which gives it the appearance of a three-storeyed building. On the roof there is a domical canopy in the centre, and four kiosks on the corners. Among the religions that came to India and found here a congenial home, are Christianity and Islam. Christianity reached India not long after Christ's own lifetime, with the arrival of St. Thomas, the Apostle, in 54 AD. The Syrian Christian Church in Southern India traces its roots to the visit of St. Thomas. With the arrival of St. Francis Xavier in 1542, the Roman Catholic faith was established in India. Today, Christians of several denominations practice their faith freely. Among the early Church buildings, one of the best examples of architecture can be seen in Diu, on the West coast of India. The island of Diu is situated off the Saurashtra coast of Gujarat bordering Junagadh district. A tiny Portuguese colony till 1961, Diu still clings to its colonial roots, and possesses one of the finest examples of church architecture in India. A mixed architecture of Portuguese and local Gujarati styles make the churches an interesting study. Three huge churches tower over the skyline of Diu. St Thomas’s Church, which now houses the Diu Museum, has the antique catholic statues, various stone inscriptions of the earlier rulers, wooden carvings, idols, shadow-clocks and other important artifacts have been collected from various sites and displayed. The Church of St Francis of Assisi is now a hospital. St Paul’s, which is still functional, is architecturally the most attractive church not only in Diu, but in India. This Church is dedicated to our Lady of Immaculate Conception. Its construction began in 1601 and was completed in the year 1610. The main façade of the church, perhaps the most elaborates of all Portuguese churches in India, is adorned with curiously treated volutes and shell-like motifs. The church has an excellent selection of wooden panelling and furniture inside, including an extravagantly carved 400-year-old pulpit. It also has excellent paintings and a high ceiling with arches. The association of Islam with India is over one thousand years old. Today India has the second largest Muslim population in the world, next only to Indonesia. With over 138 million people or 13.4 percent of India’s total population, Muslims constitute the second largest religious group in this country and their places of worship are a common sight. The mosque of the Muslims is called by them Masjid, literally ‘the place of prostration.’ Muslims offer prayers in congregation and accordingly their mosques are open and spacious. The prayer hall or the Liwan consists of an arch or Mihrab, which marks the direction of the Kabah at Makkah. Allah builds for him a similar house in paradise’. It is not surprising that the Muslim rulers of India constructed a large number of mosques in their domains. With the passage of time some of these fell into disuse, while others continue to attract the believers of Islam. One such majestic mosque, which once stood in the walled city of Shahajahanabad, is the Jama Masjid of Delhi. The Jama Masjid, also called Masjid-i Jahannuma, is one of the most impressive mosques in India. It was built by the Mughal Emperor Shah Jahan in 1656. A daily toil of five thousand workers took it six years and a sum of ten lakh rupees to complete. The Jama Masjid stands on a lofty terraced basement built entirely of red sandstone. A flight of steps leads to the imposing gateways on the north, east and south. The gateways open into a square courtyard or Sahan, which is surrounded on three sides by arched cloisters or Riwaq. The Liwan or the prayer hall consists of a large multi-foil arch in the centre, which is set within a rectangular frame and is adorned with two domed pilasters on the top. On either sides of this central arch, is a series of smaller multi-foil arches, with marble panels on the top. These panels record the name of the builder, date of construction, amount spent on the building and similar other details in beautiful Nastaliq letters. At the extreme ends of this magnificent façade stand two minars that rise to three storeys and are surmounted by 12-sided marble cupolas. The entire prayer chamber is covered by three shapely and elegant domes of white marble, ornamented with vertical stripes of black marble. The Jama Masjid of Delhi is the largest and the most well known mosque in India. In spite of its vast size, it is remarkable both architecturally and decoratively for the perfect balance and rich variety with which its components have been combined together. The architecture of the places of worship though different in various religions, had one common element, and that was the devotion and reverence of its builders. Every project, whether big or small, was undertaken by them with same zeal as if they were offering their prayers in stone. We will meet once again next week, and travelling on our time machine, we will once again transcend the barriers of time and space, to be with the master creations of the Master Builders of India. Until then, its Good Bye and Jai Hind. Acharya, Prasanna Kumar. An Encyclopaedia of Hindu Architecture, Reprint. 1998. Agrawal, R.C. Kashmir and its Monumental Glory, 1998. Arshi, P.S. Sikh Architecture in Punjab, New Delhi, 1986. Brown, Percy. Indian Architecture: Buddhist and Hindu Periods. 5th ed. Bombay, 1965. Brown, Percy. Indian Architecture: Islamic Period, 5th ed., Bombay, 1968. Champakalakshmi, R. The Hindu Temple, New Delhi, 2001. Chanchreek, K.L. and Jain, Mahesh K (eds.). Jaina Art and Architecture: Western and South India and Jaina Bronzes in Museums, New Delhi, 2004. Clermont, Lothar. Jainism and the Temples of Mount Abu and Ranakpur, 1998. Deva, Krishna. Temples of India, 1995, 2 vols. Dhaky, M.A. Encyclopaedia of Indian Temple Architecture, Volume 2, 1998. Stratton, Eric. The Evolution of Indian Stupa Architecture in East Asia, New Delhi, 2002. Fergusson, James and Burgess, James. Cave Temples of India, London, 1880. Grover, Satish. Buddhist and Hindu Architecture in India, 2nd ed., New Delhi, 2003. Havell, Ernest Binfield. Encyclopaedia of Architecture in the Indian Subcontinent, Reprint. New Delhi, 2000, 2 Vols. Kaumudi Marathe. Temples of India: Circles of Stone, 1998. Krishna Deva. Temples of India, 2 volumes, 1995. Kumar, Sehdev. A Thousand-Petalled Lotus: Jain Temples of Rajasthan – Architecture and Iconography, New Delhi, 2001. Longhurst, A.H. The Story of the Stupa, Reprint. New Delhi, 1992. Lothar Clermont. Jainism and the Temples of Mount Abu and Ranakpur, 1998. Maheshwari, Sanjeev and Garg, Rajeev. Ancient Indian Architecture (From Blossom to Bloom), New Delhi, 2001. Michell, George (ed.). Encyclopaedia of Indian Temple Architecture: South India: Dravidadesa: Later Phase, c. A.D. 1289-1798, Vol. I, Part 4-A, New Delhi, 2001, 2 Parts. Mohan, V.K. Art and Architecture of the Telugu Cola Temples, 1996. Rajesh, M.N. Sacred Sites: The Buddhist Monastery, 1998. Ramesh Chandra (ed.). Temples of India, New Delhi, 2004. Seshadri, A.K. Sri Brihadisvara: The Great Temple of Thanjavur, 1998. Tucci, Giuseppe. Stupa: Art, Architectonics and Symbolism: Indo-Tibetica, Edited by Lokesh Chandra. Reprint. New Delhi, 1988.